ALS is a fatal motor neuron disorder characterized pathologically by TAR DNA binding protein ( TDP-43 ). The function of TDP-43 is uncertain, and role in ALS remains speculative. Genome scanning reveals mutations associated to neural apoptosis. 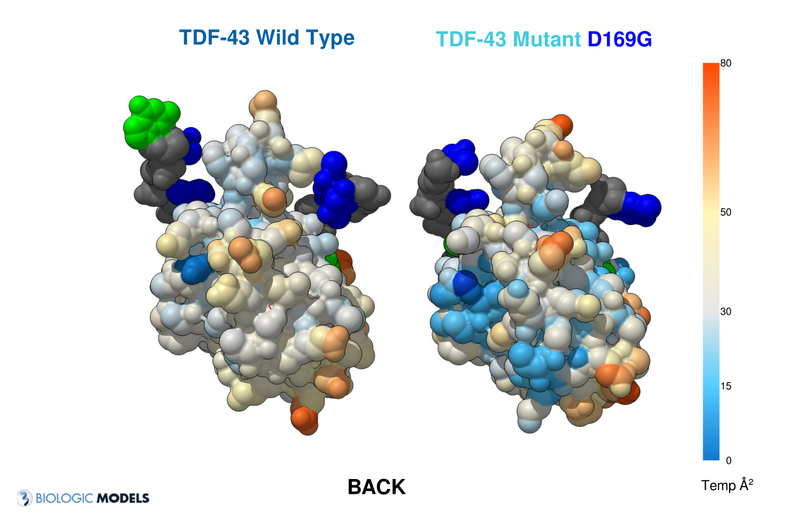 While TDP-43 mutations have been identified, how these mutations are linked to ALS remains unclear. 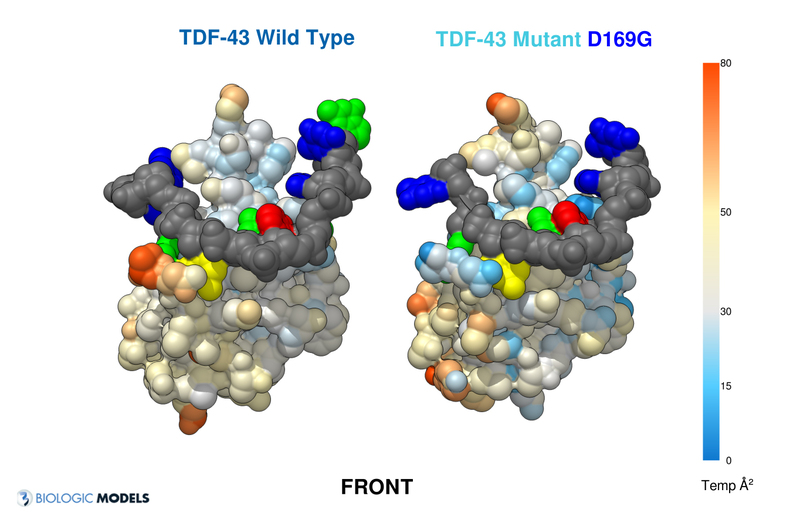 One of the mutants, D169G, had higher thermal stability than wild-type TDP-43 and that it was cleaved by caspase 3 more efficiently, producing increased levels of the C-terminal 35 kD fragments (TDP-35) in vitro and in neuroblastoma cells. 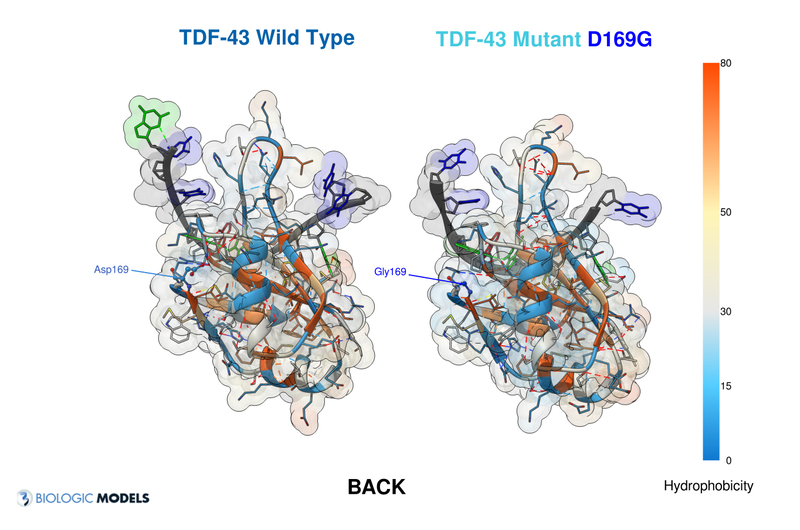 The crystal structure of the TDP-43 RRM1 domain containing the D169G mutation reveal that the D169G mutation induces a local conformational change in a β turn and increases the hydrophobic interactions in the RRM1 core, thus enhancing the thermal stability of the RRM1 domain. 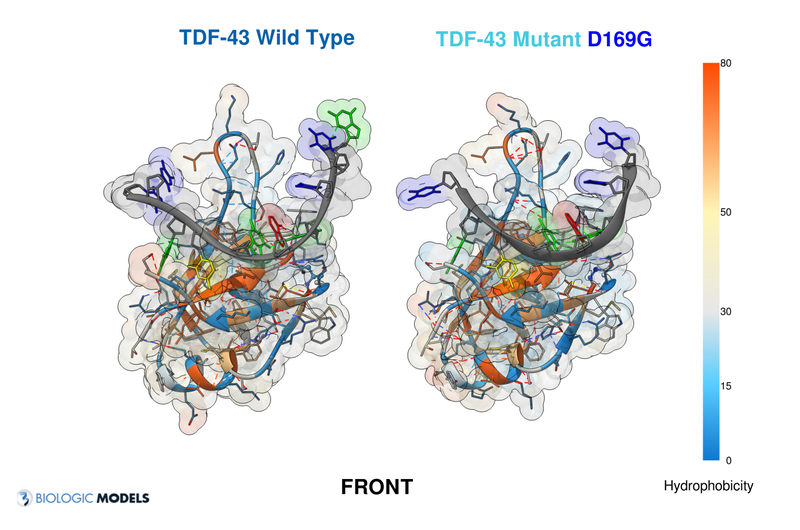 TDP-43 mutations are associated with ALS yet it remains unclear how mutations impact function. TDP-43 is colored blue, and the DNA chain backbone yellow. 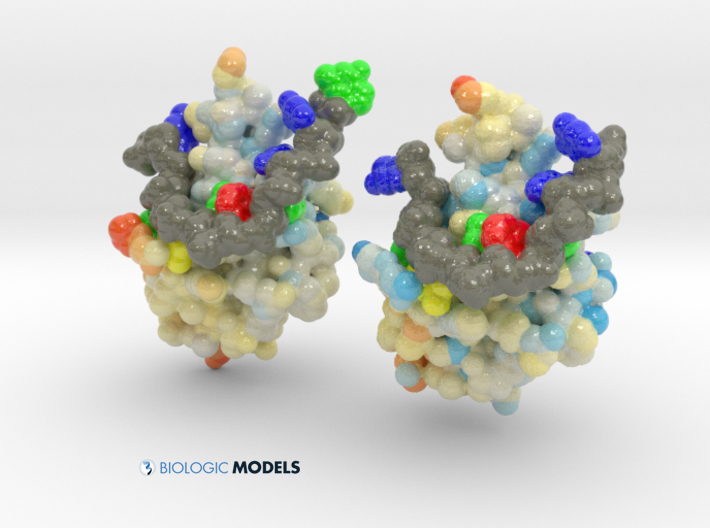 These 3D printed models of Human TDP-43 in Complex with Single-Stranded DNA visualize the thermic differences between Wild Type and D169G Mutant. The surface of TDP-43 is colored Blue-White-Red according to the protein’s atomic temperature. 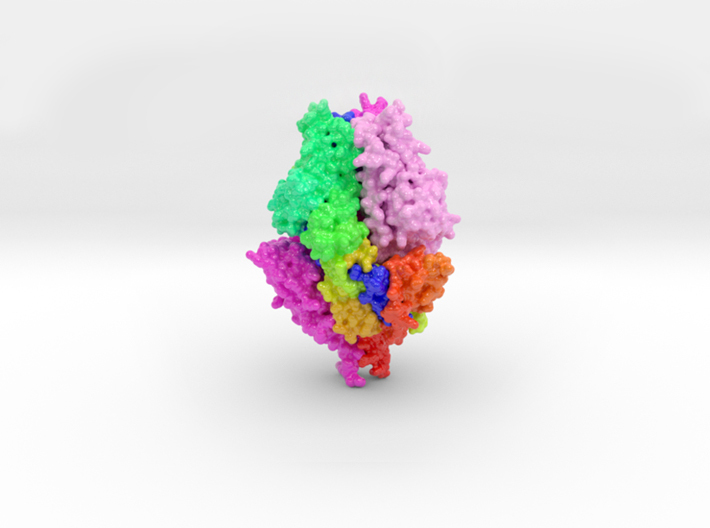 Each nucleotide is colored uniquely (Adenine: red, Cytosine: yellow, Guanine: green, Thiamine: blue). 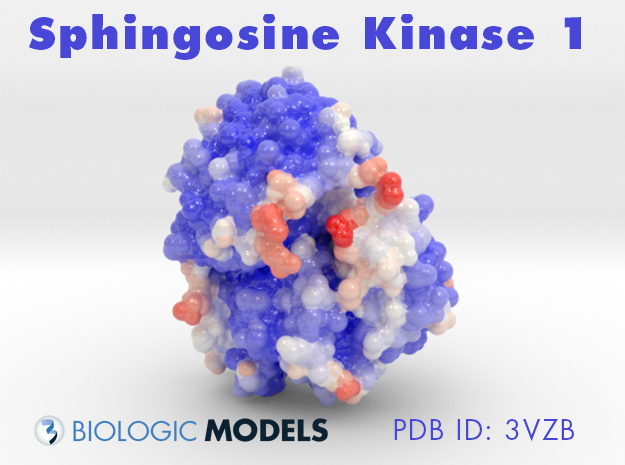 These models were created from PDB IDs: 4y00, and 4y0f and 3D printed in full-color sandstone.